Reposition or launch a new brand? Reposition or introduce a new brand? As noted in the repositioning section, brands/products that are considered for repositioning are typically under-performing products. Because of the significant challenges of successfully repositioning the product (as discussed in challenges of repositioning), firms will also consider viable alternatives to repositioning. 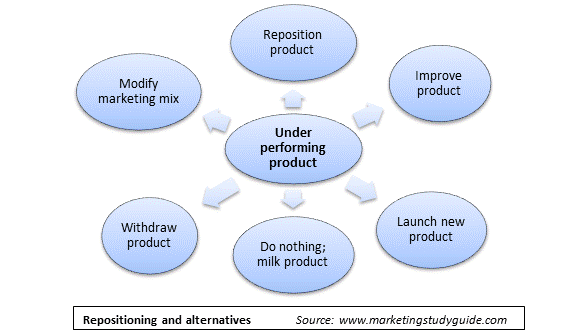 One main choices for managing an under-performing product are shown in the following diagram. In order to successfully determine the most appropriate option for improving the performance of a specific product, the organization needs to identify the core reasons for the product’s weak results. This insight will significantly guide the choice of action. However, the following table provides some general principles about when each option should be used. For repositioning to be the best option, there must be three important ingredients present.The first is lack the poor performance must be attributable (mainly) to the product’s current positioning.The second is that there needs to be a viable positioning space available for the product to be repositioned towards.And finally, the product must have specific design and features or reasonable brand equity. In other words, the product must have “something going for it”. On occasions, products will have weak performance simply because they do not have enough relative advantages, or they are lacking an important product feature, and so on.The simple approach here, which is quite common, is to improve the product in some way. And other than using “new and improved” and some packaging changes, repositioning is usually not required. It may be simpler and less costly to develop and launch a new brand/product and withdraw the existing product offering.This option would be the best choice if repositioning would be cost-prohibitive, or the product required a major redesign and improvements, or if the brand equity of the product was quite low, or if a substantial repositioning (that is, a major change in understanding) was required. Another option is to simply withdraw the product, without replacing it.This would be suitable if there was no viable repositioning space and the current product was either unprofitable or its poor performance was affecting the brand equity of the firm’s other products. Alternately, the firm could decide to milk the products.A firm would probably take this view on a minor product (or one that needs a major overhaul). The goal is to make the product as profitable as possible, before eventually withdrawing it.The common approach in this regard would be to eliminate any investment in the product (that is, no product improvements or promotional support), as well as increasing the average price through the removal of any sales and trade promotions.